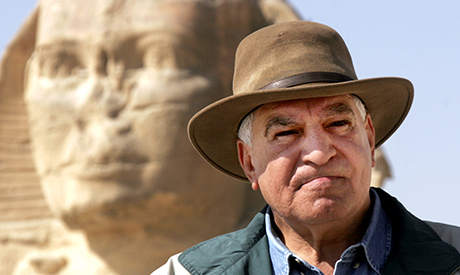 World-renowned Egyptologist and former antiquities minister Zahi Hawass is under investigation by Egypt's authorities on charges of illicit gains, Al-Ahram's Arabic news website reported on Wednesday. The superstar archaeologist and former secretary-general of the Egyptian Supreme Council of Antiquities (SCA) has been accused by officials at the council of illegally acquiring a fortune of some $14 million kept in US banks. This is not the first time such accusations have been levelled at Hawass, but past investigations cleared him of such charges. Hawass has gained prominence in international media throughout his career, appearing in several documentaries and television series, including Chasing Mummies: The Amazing Adventures of Zahi Hawass, which was aired on the History Chanel in 2010. In April 2011, Hawass, who had recently been re-appointed as antiquities chief in the newly-formed cabinet of then prime minister Essam Sharaf, was sentenced to serve one year in jail for refusing to fulfil a court ruling over a land dispute. He was also relieved of his governmental duties and ordered to pay a LE1,000 fine. Hawass had initially resigned from his ministerial post when he was criticised for his close ties to ousted president Hosni Mubarak. The SCA appealed the court ruling, arguing that the land in question included monuments and should therefore be treated as government-owned land. Awarded a doctorate in Egyptology from the University of Pennsylvania in 1987, Hawass is the author and co-author of several books, his latest being Ancient African Kingdoms on the Nile: Nubia, released in 2012. He was profiled as one the world's 100 most influential people by Time magazine in 2006. I hade the opportunity to collect several books dealing with the egyptology among them Hawass's once. I also collected some TV documentaries where he appears as the director of excavations at Giza, Saqqara and Baharia Oasis. In the documentary he was ok, however in his books all of his work is tainted with the fact that he kneels a lot to the family of Hosni Moubarek. Take for instance, in his book the REALM OF THE PHARAOHS he dedicated it in the full first page for Mrs Suzanne Mubarak for her commitment to peace, women and children. Does he need to do that? Yes because if he doesn't do it he would be ousted from his job. There many people in Egypt who were forced to do so, or they won't be there. This phenomenon existed also in Tunisia where people are forced to be member of Ben ALI party elsewhere no access to Public sector jobs. Certainly Hawass intensions were to work for the goodwill of Egypt but not to Moubarak. The Egyptians like him and also like what he did for Egypt. And what has he done for Egypt exactly? Oh yeah? What has he done for Egypt other than lie about Egypt's history, he has most modern Egyptians believing that their ancestors were Ancient Egyptians when most of their ancestors didn't come until the invasion of Muslims from the Middle East. This man has always been a scam and phony.